A mushroom cloud from the world’s first successful hydrogen bomb test, on Nov. 1, 1952. North Korea claims to have tested a hydrogen bomb on Wednesday (Jan. 6), a weapon more powerful than the bombs that devastated the Japanese cities of Nagasaki and Hiroshima during World War II. In contrast, the first test of a thermonuclear weapon, or hydrogen bomb, in the United States in November 1952 yielded an explosion on the order of 10,000 kilotons of TNT. Thermonuclear bombs start with the same fission reaction that powers atomic bombs — but the majority of the uranium or plutonium in atomic bombs actually goes unused. In a thermonuclear bomb, an additional step means that more of the bomb’s explosive power becomes available. First, an igniting explosion compresses a sphere of plutonium-239, the material that will then undergo fission. Inside this pit of plutonium-239 is a chamber of hydrogen gas. The high temperatures and pressures created by the plutonium-239 fission cause the hydrogen atoms to fuse. This fusion process releases neutrons, which feed back into the plutonium-239, splitting more atoms and boosting the fission chain reaction. Governments around the world use global monitoring systems to detect nuclear tests as part of the effort to enforce the 1996 Comprehensive Test Ban Treaty (CTBT). There are 183 signatories to this treaty, but it is not in force because key nations, including the United States, did not ratify it. Since 1996, Pakistan, India and North Korea have carried out nuclear tests. Nevertheless, the treaty put in place a system of seismic monitoring that can differentiate a nuclear explosion from an earthquake. The CTBT International Monitoring System also includes stations that detect the infrasound — sound whose frequency is too low for human ears to detect — from explosions. Eighty radionuclide monitoring stations around the globe measure atmospheric fallout, which can prove that an explosion detected by other monitoring systems was, in fact, nuclear. Follow Stephanie Pappas on Twitter and Google+. Follow us@livescience,Facebook & Google+. Original article on Live Science. The blistering advance of technology we are experiencing in the 21st century is nothing short of mind-boggling, and the rate of change being exponential, 2015 was by definition the busiest year yet. So before the Gregorian calendar keels over into 2016, let’s take a wander through some of the year’s most significant, salutary and attention-grabbing examples of scientific achievement, technological innovation and human endeavor. It’s been over a century since Einstein postulated the wave/particle duality of light, but it wasn’t until earlier this year that was directly observed by EPFL researchers, who captured the phenomena by using a sophisticated electron imaging technique. Across the Atlantic geochemists discovered that life on Earth started hundreds of millions of years earlier than previously thought, engineers figured out how to make 3D objects from the much-vaunted wonder material graphene, and physicists set a new distance record for quantum teleportation of information over optical fibers. Audi created a stir with the creations of synthetic diesel from just water and carbon dioxide, as did UAB researchers when they created the first experimental wormhole that links two regions of space magnetically. But perhaps the oddest thing to emerge from the lab in 2015 was an unboiled egg, which may or may not go well with a newly discovered strain of seaweed that tastes like bacon. While the ability to fully map the human brain may be some way off, if it’s even possible at all, our ability to both understand and imitate its complexities took some serious strides forward in 2015. Examples include the development of abrain imaging tool that can see all of the brain’s cellular objects and many of their sub-cellular components, a lab grown “brain organoid“ equivalent in size and structure to that of a five-week old fetus,intelligence boosting gene therapy (for mice only at this stage), successfully using brainwaves to help a paralyzed man walk again and an array of new approaches to combating cognitive disorders likeAlzheimer’s disease. Fifty years after Moore’s Law was conceived, there were many advances that could ensure computing power continues to accelerate exponentially, including the use ofmemresistors to create advanced computers that function like the human brain. News of the first biologically-powered computer chip emerged just this month and the long-sought goal of practical quantum computing also crept closer on several fronts, with breakthroughs such as photonic processors,quantum hard drives and silicon-based quantum logic gates. 2015 saw a string of stunning achievements in space exploration, but it is most likely to be remembered as the year we got to Pluto – at least, the New Horizons probe did, sending back beautiful, invaluable images and data from the dwarf planet and its moons some 3 billion miles away. Some significant space anniversaries also passed in 2015, namely 25-years since thelaunch of the Hubble Space Telescope and half a century since the first space walk. But the biggest thing in space this year was the biggest thing in space – a newly-discovered ring of nine galaxies 7 billion light years away and 5 billion light years wide that covers a third of our sky. In skies closer to home, the age of commercial space flight rolled on with SpaceX providing the clear highlight by successfully nailing the first landing of an orbital space booster rocket earlier this month. Read more in our full 2015 space round-up. While 3D printing had already moved well beyond plastic trinkets, 2015 saw it begin to show its true potential as an industrial process. Perhaps more accurately described as “additive manufacturing” in this context, we saw this process used to create the first 3D-printed jet engine, the first FAA approved jet engine part, and a jet-powered unmanned aerial vehicle that can reach speeds of up to 150 mph (240 km/h). Add in a variety ofbody parts, including replacement titanium sternum and rib cage, teeth, hair, houses,bricks and cars, and you begin to get the picture of just how far-reaching this technology is set to become. Our pick for the most thought-provoking object to emerge from a 3D printer this year isMushtari – a 3D-printed photosynthetic wearable embedded with living bacteria designed to produce sugars or bio-fuel when exposed to light. Conceived as a kind of living spacesuit, this wearable microbiome would act like an organ system to ingest biomass, absorb nutrients, and then eject waste products when exploring other worlds. Perhaps the most unnerving news from the world of robotics this year came from the University of Cambridge, where researchers created a mother robot that can not onlybuild its own children, but mimic the process of natural selection to improve their capabilities with each generation. Despite this slightly depressing news, watching the world’s most advanced robots struggle to open doors at the DARPA robotics challenge finals does suggest we have a little way to go before robot armageddon strikes – though we shouldn’t dismiss that scenario, as we were reminded in July when over 1,000 robotics and artificial intelligence researchers urged the UN to ban on the development of weaponized AI. We also saw the beginnings of another, somewhat surprising element of AI begin to take shape – thecreative potential of robots as painters, musicians, architects and storytellers. 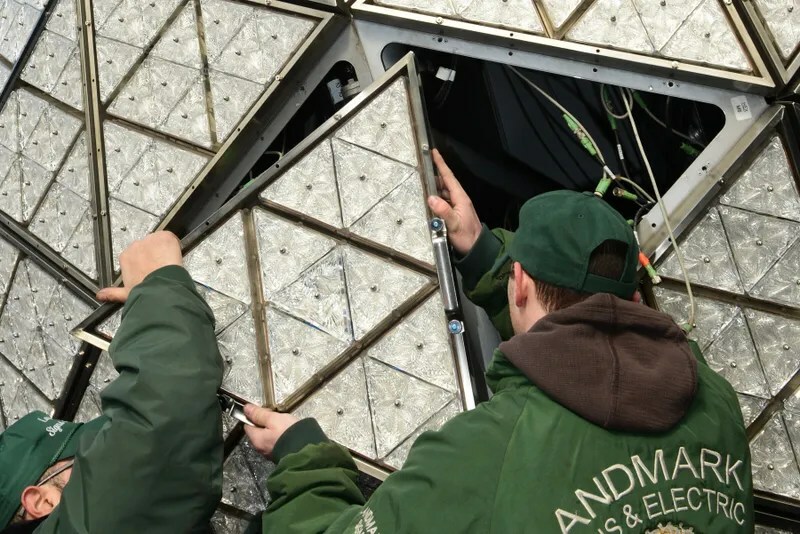 This year saw renewable energy overtake coal in the UK’s energy mix, Portland install water pipes in that generate their own electricity, the Wendelstein 7-xexperimental fusion reactor fire up and solar energy – particularly cheapPerovskite cells – continue to advance, but innovations in the energy storage arena also grabbed our attention at Gizmag. Tesla unveiled its home battery storage system, Daimler and Nissan gave used EV batteries a second lease of life and solar energy and a number of promising new battery technologies made headlines, including lithium-air batteries, flow batteries and energy dense hybrid supercapacitors. Finally, let’s see out the year with a quick look at some of the record-breaking feats that 2015 delivered. The world’s thinnest light-bulb was created using (surprise, surprise)graphene, the largest astronomical image of all time – at 46-billion pixels – was complied, a robot walked 83 miles in 54 hours, a maglev train hit 375 mph (603 km/h), Stuttgart University students took an EV from 0-62 mph (100 km/h) in a blistering 1.779 seconds, and a Canadian cyclist clocked 85.71 mph(137.9 km/h) to set a new world record for human-powered speed. Of course, we’ve only just scratched the surface when it comes to significant moments in science and technology, let alone the biggest news of the year across the many fields that Gizmag covers, so for a closer look at more of the best 2015 had to offer, follow the links below. Before you go … we’d like to wish all our readers a happy new year! We very much appreciate the support and feedback you’ve given us in 2015. Have a safe and innovative 2016! The past year saw scores of new motorcycles introduced and some new technological trends gain ground. From turbo-charged commuters to overpowered race specials and from electronic safety equipment to smartphone integration, motorcycle technology in 2015 had something for every taste. A major driving force in the motorcycle industry is European legislation. As a new set of emission standards comes gradually into play during the next 365 days, manufacturers are coming up with ways to keep their engines’ specs within legal boundaries without sacrificing too much power – and this seems to entail the demise of the air-cooled engine. Rare examples like Moto Guzzi’s V7 and V9 or Ducati’s Scrambler simply prove that liquid cooling can only be avoided when horsepower is not the dominant selling point. On the other hand, Triumph and BMW have already broken new ground with liquid-cooled versions of the boxer and the in-line twin engines. The never-ending quest for road safety also motivates the motorcycle industry, as electronic support systems keep on propagating to more two-wheelers. Features like traction control or selectable ignition mapping – once reserved only for race-worthy superbikes – can be found today even in scooters like Piaggio’s Beverly 350 i.e. Finally, the global financial crisis that has stunted motorcycle production for several years, in combination with the expansion towards Asia’s emerging markets, has prompted manufacturers to reconsider their modus operandi. Small capacity engines and fuel efficiency have become part of every major factory’s standard vocabulary in a quest to address the market needs of countries like India and China, where millions of potential buyers consider a 300 cc engine to be a big unit. At the same time, low running costs have become a major selling point in Western markets, a cause served efficiently by such smaller engines. Here’s a look at the main technological trends of the motorcycle industry that have emerged in 2015, and a glimpse of what to expect in the coming years. Turbo and superchargers have not been associated with motorcycle engines for many years, despite the fact that they are widely used in cars. One of the biggest advantages of two-wheelers – low weight – means that power is usually more than enough for a thrilling result without having to resort to forced induction solutions. Kawasaki changed this with the introduction of its H2/H2R supercharged superbikes. These models are not meant for the masses, retaining their high-powered exclusivity for those lucky few with pockets deep enough to support their taste. Neither H2 model can claim to be faster than a conventional superbike other than in a straight line, but this hasn’t taken anything away from the legendary status they already enjoy. The reason is very simple: they reintroduced non-atmospheric engines in mass production after several decades. The future though is not all about absolute power, though. At the recent Tokyo Motor Show, Suzuki’s XE7 motor was kept quietly in a glass display, with a small inscription reading: “Under development, turbo-charged engine for motorcycles, in-line twin, DOHC, 4-valve.” That was it. No press release, no rumors, no information. Suzuki had unveiled the Recursion concept model at the same venue in 2013. The 588 cc twin-cylinder engine with a turbo charger made the connection with the XE7 more or less inescapable. Some more digging in the web reveals a patent that Suzuki filed in USA earlier in 2015 for a similar turbo charged engine, with the only notable difference being the position of the intercooler. Instead of laying it behind the engine block as in the patent drawings, the Tokyo exhibit features the intercooler above the cylinder heads. What doesn’t change is the central concept: a mid-capacity engine that targets output figures up to 100 hp. Turbo charging is applied to beef up its midrange torque, combining usable power with fuel economy, since one doesn’t have to rev the engine high in the hunt for power. Kawasaki is on the same path, unveiling the Spirit Charger concept bike powered by a new four-cylinder in-line Balanced Supercharged Engine at the Tokyo Motor Show. Although very few details have been revealed, practically every relating statement includes the words “increased fuel economy.” Apparently this is how Kawasaki will start cashing in on the fame and glory of the 300-hp H2R beast. If we were to place a bet, we’d lay our money on a mid-capacity project that uses supercharging in the same manner as Suzuki intends for its turbo. Forced induction is making a comeback in motorcycle production and this time it’ll be neither for show, nor for racing. It will be all about practicality and fuel efficiency. Ever since the World Superbike Championship (WSBK) rights were acquired by Dorna Sports – the Spanish company that also runs MotoGP – all the talk has been about reducing costs. Despite optimistic motorcycle sales figures in Europe with positive rates for the first time after several negative years, the racing world continues to bleed sponsorship money. The WSBK Championship is changing fast, as the top Superbike and Supersport classes gradually converge with the relative Superstock categories, translating to less tuning and modification freedom for race teams. For the manufacturers the workaround is the incorporation of more race equipment in the production models that are homologated for the WSBK Championship. During the last few years this pattern is evident, as all the latest superbikes feature an impressive arsenal of electronic systems ranging from quick shifters to numerous electronic controls. Adjustable geometry features are also emerging, while the power output of the latest generation of superbikes is simply mind-boggling. All the latest road-legal superbikes such as the Kawasaki ZX-10R, Ducati Panigale, BMW S1000RR, Yamaha R1M and Aprilia RSV4 range around the 200-hp mark, and Aprilia just unveiled the new RSV4 R-FW (Factory Works) series, with a range of track-only models that can deliver in excess of 230 hp! We have a lot to look forward to in the near future, as more factories gear up for their own new extreme superbikes. Suzuki has already previewed its new GSX-R1000 with variable valve timing, expected to be officially unveiled as a 2017 production model. Honda has kept silent so far, yet we have every reason to expect a similar move from the largest motorcycle manufacturer of the planet in 2017. Will it be an RCV-based V4 or a brand new in-line four CBR? We can’t tell yet, but we can be sure it will produce obscene amounts of power, up to par with the competition. Word has it that BMW and Ducati may also be preparing new superbikes in the lead up to a very hot 2017 model season. When BMW announced the 2016 G 310 R, we had to dig back to 1966 in order to uncover the last time the Germans produced a low capacity motorcycle engine. Then it was the R27, the last of a venerable series of 250 cc singles. Now it’s the result of a collaboration between BMW Motorrad and India’s TVS that’s aiming for an affordable entry-level motorcycle that targets strong sales on both edges of the rainbow. BMW sees in the G 310 R a potential success in western markets, both as a learner bike and as an economical commuter, but it also seeks the key to unlocking Asian markets, where the average Bavarian boxer twin is as unreachable as a Bentley to the typical middle-class American or European customer. All the Japanese factories have had models in this capacity class for years, so now it’s up to the European and American companies to contest this market segment. Harley-Davidson has already taken the first step with its 500 cc Street, while KTM has invested in a wide Duke family, with the smaller models of 125, 200 and 390 cc built in India by its partner, Bajaj. In 2015 Ducati undersized the Scrambler to 400 cc, Benelli has a 320 and a 500 cc model family on offer, while Triumph is said to be working on a 300 cc model. Also Royal Enfield is about to introduce its new 410 cc engine at the Indian Auto Expo in February, starting with an adventure model that will be called the Himalayan. The 300 to 500 cc class is set to become very interesting in the next few years. Just when we thought we had seen it all, two concepts from EICMA – the Honda City Adventure and the Vertigo Ursus – attempted to introduce a new market segment. In typical Honda fashion, the City Adventure concept comes with no information regarding its nature, other than what we can guess. That’d be an automatic transmission, a typical scooterish riding position, practical amenities such as underseat cargo space and some basic off-road capabilities. Unconfirmed rumors put an Integra frame and 750 cc twin underneath the plastic body. But there’s a far more interesting twist to this story. At the Motorcycle Live show in London, a Honda representative revealed that the City Adventure concept is probably heading for production in 2017. A similar concept model was revealed by Vertigo, a new Spanish company that specializes in trial bikes and has claimed a stake at fame through the cooperation with a certain Mr. Dougie Lampkin, holder of no less than 12 World Trial Championships. The Ursus concept bike may have gone under the radar at EICMA, but according to Vertigo it is not just a show bike, looking at mass production down the road. The basic concept is similar to that of Honda’s City Adventure, a scooter-like automatic vehicle with a selection of engines ranging from 125 to 600 cc and thoughts of a two-wheel drive version. Adventure motorcycles enjoy great popularity all over the world, so we shouldn’t be surprised that the scooter world may also investigate its adventurous side. With both these concept models heading for production, a new segment is in the making. Less than two years ago this was a novel technology introduced through the cooperation of BMW Motorrad and Bosch as an optional package for the S1000RR superbike. In 2015 several superbikes have adopted Bosch’s cornering ABS, often under different names such as lean-sensitive, angle-sensitive or simply race ABS, but in essence it is the same system. Using data collected from a variety of sensors, the central processing unit calculates the optimal amount of pressure to be exerted on the brake pads, as well as the ideal distribution of braking force between front and rear brake, allowing for the rider to apply full pressure on the brake levers even under full lean in the center of a corner. What would definitely constitute a recipe for lowside disaster can now be a very safe procedure for any rider, regardless of his or her level of riding expertise. It probably isn’t race worthy yet, otherwise we’d have already seen it in superbike racing, as apparently flirting with the limit is a process still best served by the racer’s ultimate sensor – the human brain. There’s no question though that it will be a very valuable asset in road-going motorcycles, where emergency mid-corner braking can unfold to a very unpleasant and often dangerous situation. For this reason Bosch’s cornering ABS in 2015 has propagated to several other motorcycle segments, including the likes of KTM Adventure and Super Duke, Ducati Multistrada and BMW S 1000 XR. As the system becomes more affordable, we should expect to see it in more models, as it can benefit even the slowest of motorcycles. As is usually the case, the first motorcycles with the ability of coupling with smartphone applications were superbikes. A well know recent example would be Yamaha’s latest R1, which allows the rider to perform a multitude of tasks straight from his smartphone or tablet via bluetooth. This trend has spilled over to smaller motorcycles and in 2015 we witnessed a new system from the Piaggio Group. The new Multimedia Platform is optionally available for several new models that were unveiled at EICMA by Piaggio, Aprilia, Moto Guzzi and Vespa. In Piaggio’s case the app does not serve to setup the bike, offering its services as an alternate dashboard with some extra features, like recording route data or even marking the bike’s last parking place. Yamaha recently introduced its My Garage app, where one can customize and order a Yamaha motorcycle online. It comes in three different versions, each for the MT, Supersport and Sport Heritage model family. This trend will undoubtedly grow in 2016, at least as a supplementary gadget in line with the latest connectivity technology. The next revolution will undoubtedly revolve around electric mobility, albeit through a process that evolves at a very slow rate. If the recent EICMA showed us anything, it was the big manufacturers’ reluctance in adopting electric powertrains. The greatest yearly international motorcycle exhibition was the typical gasoline-burning feast that European and Asian manufacturers show every intention to cling on to. There are some very good reasons for this, the prime one being that battery technology is not yet able to offer range and refueling times that could actually compete with the internal combustion engine. An electric touring motorcycle isn’t a realistic prospect for the time being, as the range on offer by most current systems in the market only makes for expensive commuter bikes. The electric revolution is intrinsically tied to the evolution of electric power systems. Victory did in fact announce a (rebadged Brammo) electric road bike, the Empulse TT, but didn’t even display it in Milan, bringing only the TT Zero electric racer at a distant corner of its booth, away from the major new models that attracted all the publicity. Harley-Davidson’s LiveWire project has been displayed it at motorcycle shows and offered for demo rides, but the company doesn’t appear to be ready to start producing and marketing it. 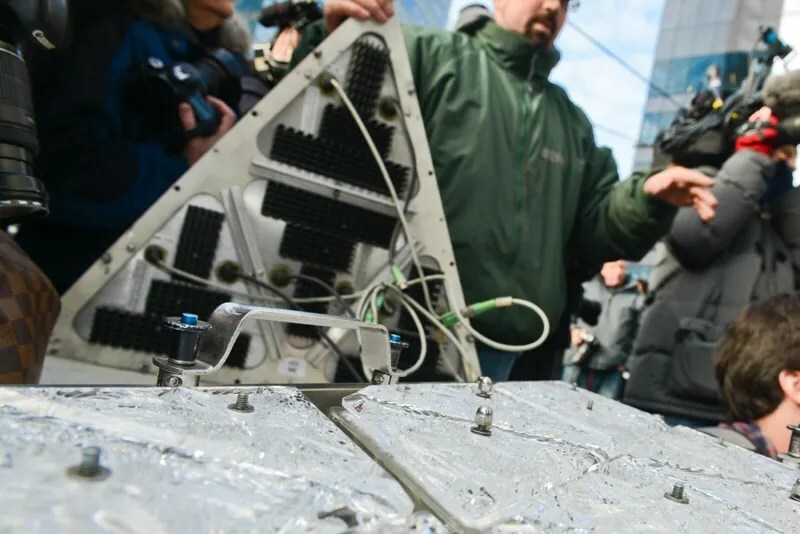 According to the company’s CEO, Matt Levatich, it is deemed too expensive, its range is too small and will probably not be produced until the next generation of batteries hits the market. As far as the major European manufacturers are concerned, BMW and KTM lead the way. BMW produces the electric C-evolution scooter and sells it in select markets around the world, while recently it announced the experimental eRRsuperbike concept – though without any evident intention for production as of yet. KTM on the other hand, has invested in the Freeride electric range with a motocross, an enduro and a road-legal supermoto model. The familiar limitations of very small range and relatively high price, mean that these are practically expensive toys. The rest of the Europeans have yet to display any interest in electric motorcycles – with the exception of Piaggio’s hybrid Mp3 three-wheeler. The same can be said for the Japanese factories that have been churning out electric scooter concepts by the dozens all though the last decade, but no production model has ever come out of this process. As for bigger motorcycles, there’s no word from Japan either. As the world slowly realizes the need for independence from fossil fuels, American manufacturers of electric motorcycles like Zero have a significant head start with several commercial models already in the market. There’s no doubt it is just a matter of time before others join in – but it doesn’t really look like it will happen very soon. If you want beautiful fireworks bursting in the sky, you’re going to need to mine the Earth first. Here’s the geology of the minerals that give fireworks their vibrant colours. Fireworks get their colour from metal salts. A salt is a chemical compound formed when an acid and base neutralize each other, resulting in a new compound where the elements are bound together through ionic bonds. Many of the salts include an oxidizer like nitrates, chlorates, or perchlorates. Along with imparting colour, these oxidizers provide oxygen, allowing the fireworks to burn. The metals or salts can also be stabilizers, keeping the colour-imparting elements stable until showtime. While not explicitly a colour-inducing element, phosphorous is also commonly included in fireworks as a fuel since it spontaneously burns in air, but also as a glowing component in darker fireworks effects. Zinc can be added to create smoke effects. A lighter medium red is created by lithium salts like lithium carbonate (Li2CO3) or lithium chloride (LiCl). 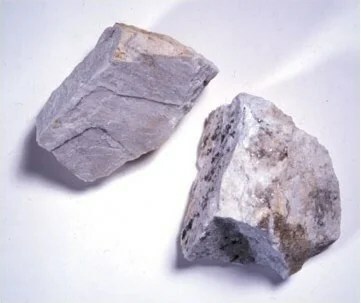 Neither occur naturally [correction: they occur in brines, creating evaporite deposits as they dry out], but lithium can be found in nearly every igneous rock in the minerals lepidolite, spodumene, petalite, or amblygonite. Both lithium salts are used in industry, as a brazing flux for aluminum, as a desiccant, or an additive in glazes. It also has biochemical uses. The brilliant, deep red is created by strontium salts like strontium nitrate (Sr(NO3)2) and strontium carbonate (SrCO3). 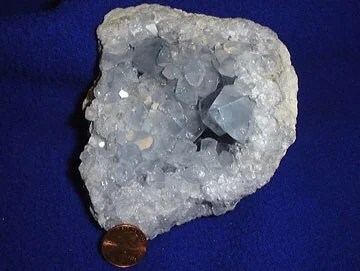 These metal salts do not naturally occur as a geological mineral, but the strontium is usually found in celestite. Strontium can also be used as a stabilizer for other fireworks effects. 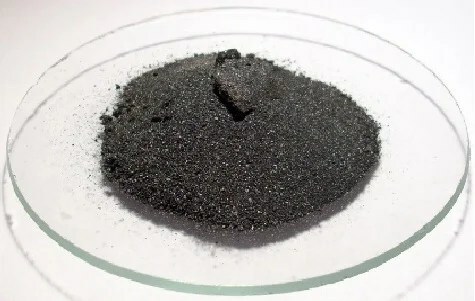 About a third of all strontium nitrate in the United States is used for pyrotechnics, but it is also used in alloys that make aluminum more tractable to casting, as an additive in glass, to make paint corrosion-resistant, and as part of drilling mud. It also finds its way into common households as a component in constructing ceramic ferric magnets (fridge magnets). Other strontium compounds star as the active ingredients in toothpaste for temperature-sensitive teeth. Orange is the result of calcium salts, usually calcium chloride (CaCl2) or calcium sulfates (CaSO4·xH2O). Calcium can also be mixed into other fireworks to enhance the colours, while other calcium salts make pretty pale pinks (namely CaCO3, CaSO4, or CaC2O4). 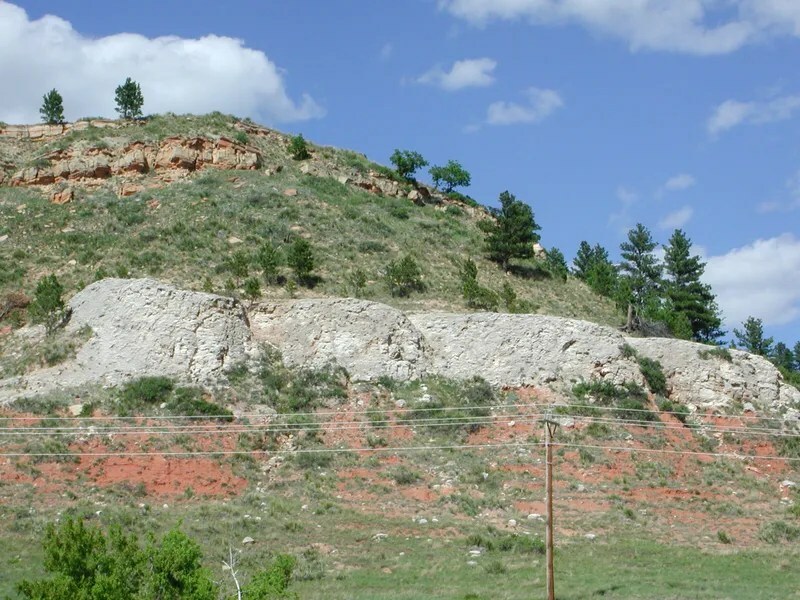 Calcium sulfate occurs naturally as gypsum, an evaporate mineral, while calcium chlorides form as the far more rare as sinjarite or antarcticite minerals but can be easily extracted from limestone. Calcium sulfate is used for producing sulfuric acid. Calcium chloride has far more uses — a desiccant, changing freezing points, increasing water hardness in aquariums, or as a firming agent in foods like tofu. Orange can also be created by a mix of strontium and sodium. Sodium makes such a bright, overwhelming yellow that it can outright hide other, more subtle colours of cross-contamination occurs. The classic salts are sodium nitrate (NaNO3) or cryolite (Na3AlF6). Sodium nitrate (NaNO3) is a metal salt which naturally occurs as the mineral nitratine. The sedimentary rocks of the Atacama Desert in South America are the largest deposit of natural sodium nitrate in the world. While other sodium salts are more widespread (sodium chloride finds its way into your home under its common name, table salt), sodium nitrate is infamous in its own right as saltpeter. Saltpeter is a fertilizer, a rocket propellent, a food preservative, and as an enamel. As most sodium salts, including sodium nitrate, can absorb large quantities of heat and release it slowly over time, it’s also being adopted for use in thermal energy storage. The brilliant emerald green fireworks are created by the barium salts barium nitrate (Ba(NO3)2), barium chlorate (Ba(ClO3)2), barium chlorite (Ba(ClO2)2), or barium carbonate (BaCO3). These metal salts do not naturally occur as minerals. 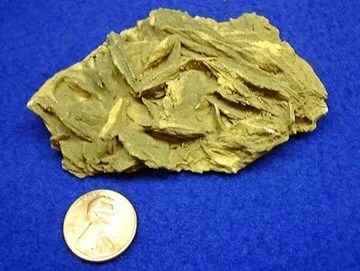 The barium within the compounds originates as barite, a barium sulfide mineral. Barium can also be used as a stabilizer for other more volatile elements. Barium blocks radiation, making it perfect for everything from a contrast-inducing milkshake prior to X-rays of the digestive track to mixing into concrete as radiation shielding for laboratories. It’s also used in oil and gas drilling, increasing density to suppress high pressure that could lead to blowouts, or in the manufacture of paints, plastic, and rubber. Copper chloride is a metal salt that can be made from either of copper’s primary oxidation states, cuprous or cupric. The copper (I) chloride (CuCl) makes a beautiful greenish torquoise firework, while the copper (II) chloride (CuCl2) generates a rich blue. More complicated compounds of copper and chlorine create intermediate shades of blue to green: copper acetoarsenite creates a striking paris green, while the mess of Cu3As2O3Cu(C2H3O2)2 is a brilliant deep blue. Copper chloride fireworks are at a relatively lower temperature than other fireworks. The metal salts rarely occurs in mineral form, but can be found in eriochalcite, nantokite, or tolbachite. 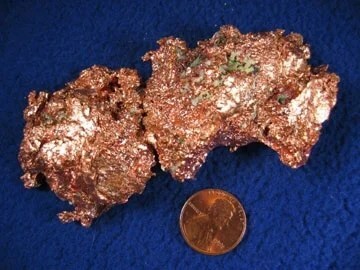 Alternately, copper can also be extracted from the minerals chalcopyrite, azurite or malachite, or even as pure native copper. Copper is malleable and fantastic at conducting electricity, making it in high demand for power generation and transmission on all scales. Alternately, a deeper indigo blue-purple is created by cesium nitrate (CsNO3). Cesium is also an oxidizer. The combination of copper and strontium, extracted from their relative source ores, creates the pale lavender of fireworks. A darker violet is created by potassium nitrate (KNO3), which naturally occurs as niter, another form of saltpeter. Like sodium nitrate saltpeter, potassium-based saltpeter is a fertilizer, a rocket propellent, as a food preservative, and to make gunpowder. A rich red-violet colour can be made from rubidium nitrate (RbNO3), although it is rarely used. Rubidium is also an oxidizer. 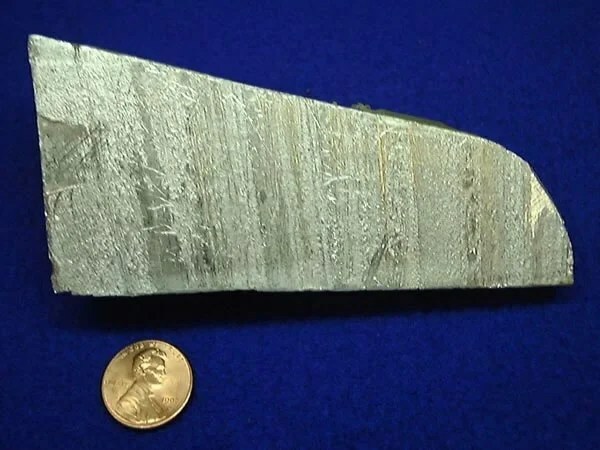 Rubidium doesn’t naturally occur as the primary metal in any mineral, but is trace element as a potassium substitute in some common minerals like feldspar and mica. Rubidium is more commonly used as a source material for catalysts and scintillation counters. The searing white is created by barium oxides (BaO), a compound formed by heating barium carbonate with coke, or by thermally decomposing barium nitrate. Sparkling white can also be created by aluminum or beryllium powders, while a more silvery white is more likely from titanium, zirconium, magnesium. Aluminum is the most common component of the bright flashes of sparkler fireworks and mag stars, producing silver or white flames. Aluminum is lightweight, malleable, and resists corrosion, making it useful in manufacturing everything from vehicles to soda cans. Aluminum rarely occurs by itself naturally, instead more commonly forming in oxides and silicates like feldspar. 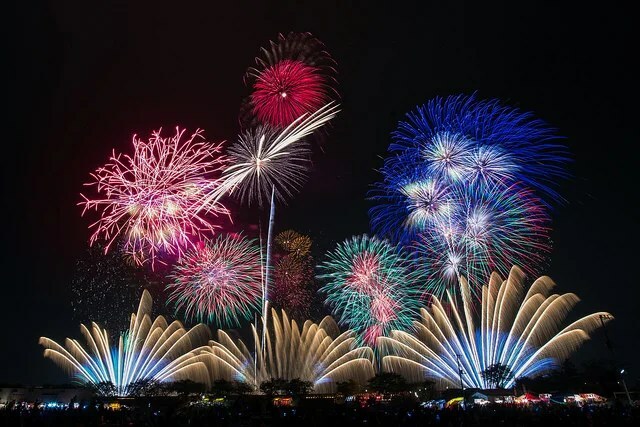 Magnesium is also sometimes used for brilliant white flashes or to enhance the intensity of other fireworks, but is less common than aluminum because it can’t form a protective oxide layer. For more glittery effects, antimony is used instead. Sparklers are made from iron filings and charcoal fragments, with the temperature strongly influencing the colour of the sparks. The inclusion of potassium can tint the sparks from the typical warm gold to a paler violet-pink. While an extremely abundant element in the Earth’s crust, iron doesn’t have a naturally-occurring native mineral. 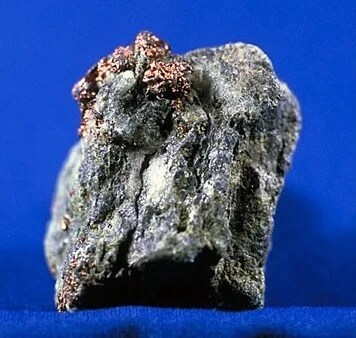 Instead, it is extracted from iron ores like hematite and magnetite. When the oxygen of iron ores is removed through heat and carbon, the result is steel, an incredibly strong and versatile material. Want more? Check out the chemistry of fireworks here. 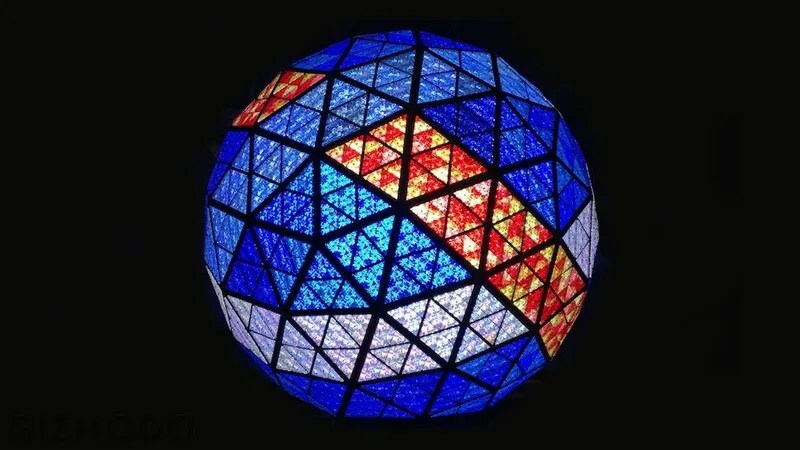 The bright ball that hovers over Times Square on New Year’s Eve is a little bit reborn this year. Sure, it’s iconic and colorful and mesmerizing as it always is. This year, however, the ball captivates the world with 288 more newly designed Waterford crystals. And, boy, are they pretty. 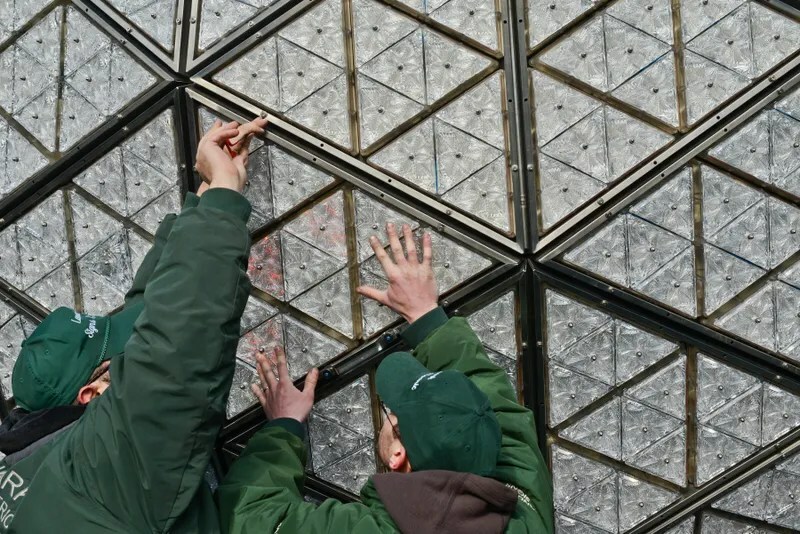 The ball drop has been a New Year’s Eve tradition in Times Square for over a hundred years, but only in the last decade or so has the ball itself become such a technological marvel. When former New York Times owner Adolph Ochs first organized the event atop the newspaper’s headquarters in 1907, the ball was made of iron and wood, weighed 700 pounds, and was covered with 100 lightbulbs. Over the years, it’s evolved beyond its iron origins in incredible ways. It got a lightweight aluminum frame in 1955 and computer controls (as well as rhinestones for more sparkle) in 1995. By the time the new millennium came around, it lookedpretty steam punk. The ball that sits atop the building today is the fifth generation, and it’s straight up space-age. Unveiled in 2008, the 12-foot-wide geodesic sphere weighed 11,875 pounds and featured 32,256 Philips Luxeon Rebel LEDs encased in 2,688 individually sculpted Waterford crystals that vary in length from 4 ¾ inches to 5 ¾ inches. Starting in 2013, Waterford began a ten-year-long process of swapping out 2,880 of the ball’s crystals. 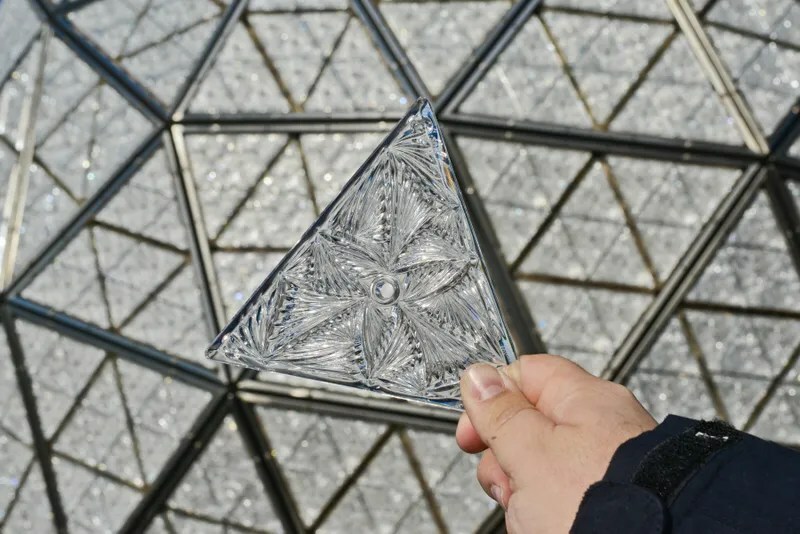 So every year until 2023, a portion of those crystal triangles are replaced with new ones that have been completely redesigned around a common theme, giving the ball a refreshed appearance. “The Gift of Fortitude” is this year’s theme. Curtis was on hand for the ball’s recent unveiling at One Times Square, the former home of the New York Times. 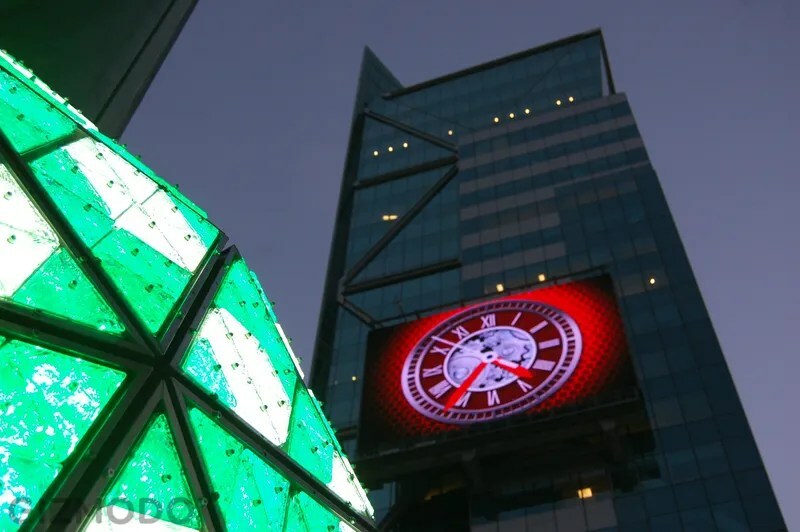 The building that once hosted two dozen floors of writers and editors now serves simply as a pedestal for the Times Square ball. With the exception of a Walgreen’s pharmacy on the three ground floors and countless billboards on the outside, the ball and its operators are the building’s sole tenants. The ball lives permanently on a pole rising up from the south side of the roof, some 760 feet above the ground. At that height, it’s built to withstand the elements. Curtis explained how Waterford brings in a team of engineers to help design the crystal pieces, that are then cut on a diamond-edged wheel. 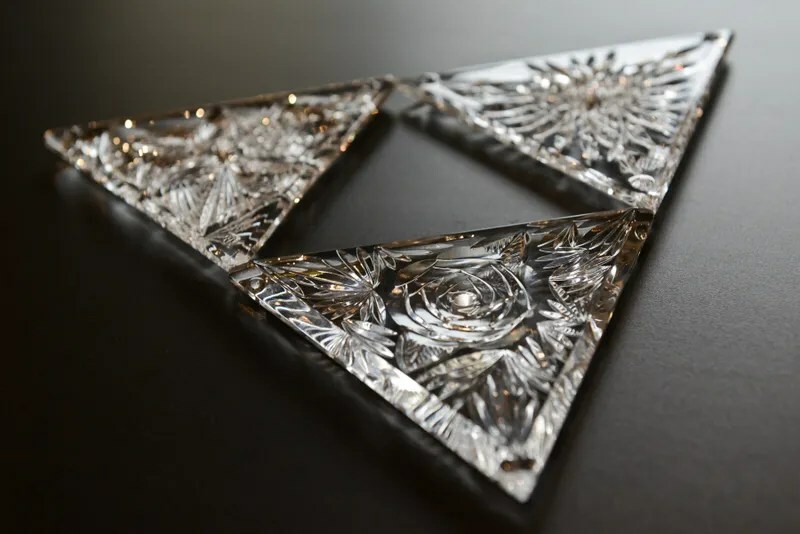 This year’s “Fortitude” batch were gradually replaced as 288 new pieces are designed, cut and installed. Most of the 288 pieces that are removed will go to charity. 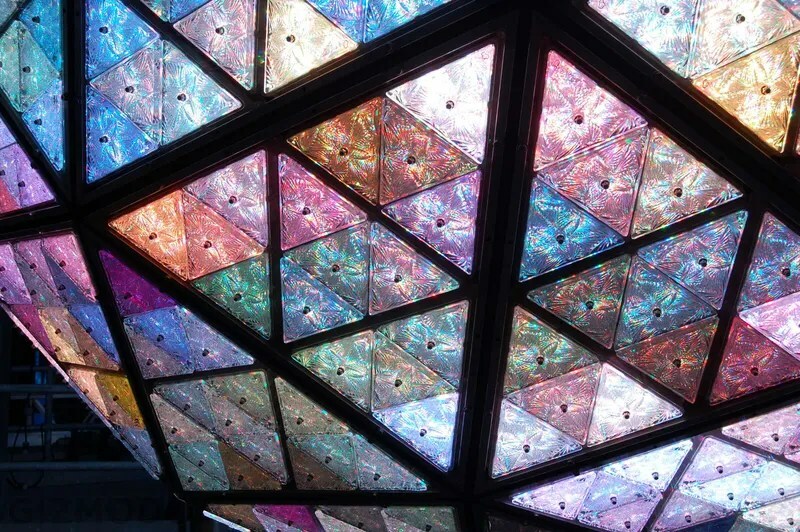 Once they’re shipped to New York City, the individual crystals are attached to the triangular panels, each of which holds 48 LEDs—12 red, 12 blue, 12 green, and 12 white. The panels are wired right into the ball’s computer system and screwed onto the frame. 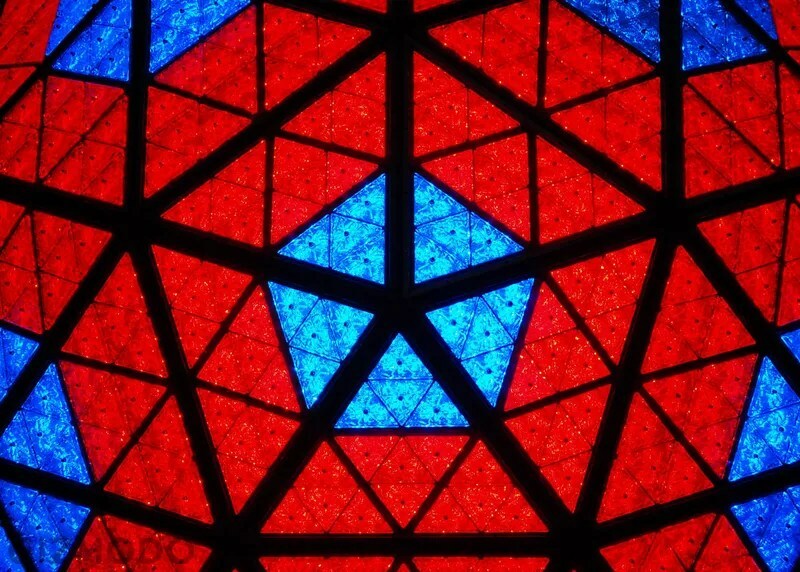 Before midnight, the ball gets to strut its stuff atop the tower, producing its kaleidoscope of effects. And there it will wait, with a skyscraper at its feet, for 365 days until it’s time again. 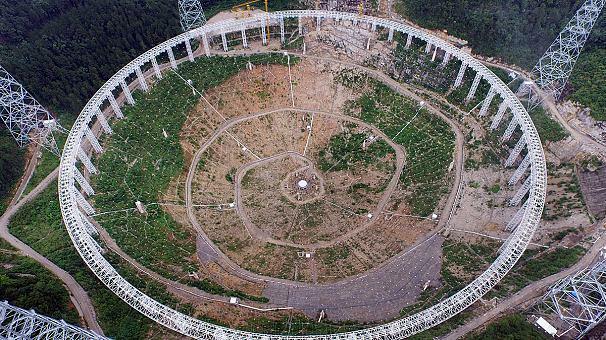 The telescope’s reflector will measure 500-meters (1,640 feet) in diameter and be equipped with 4,450 panels. Each panel is shaped like a triangle, with each side measuring 11 meters (36 feet) long. 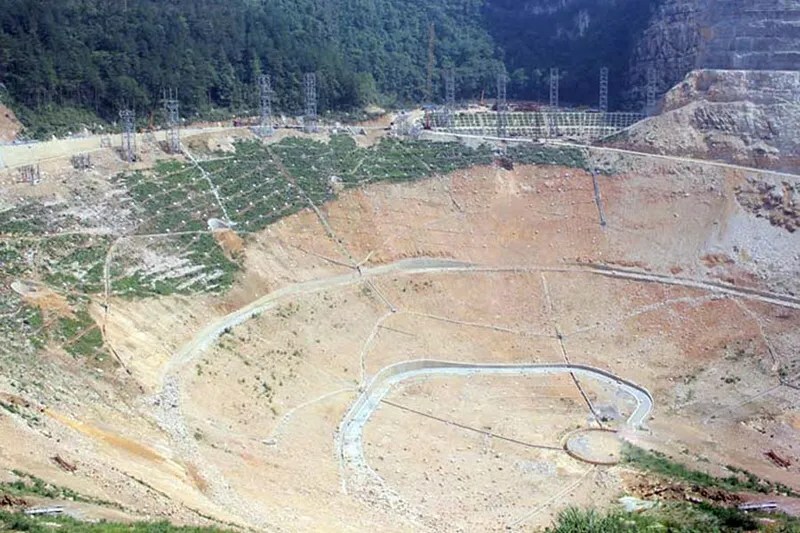 Once complete, probably next year, it’ll be the world’s largest radio telescope, exceeding even Puerto Rica’s Arecibo Observatory, which is 300-meters (984 feet) in diameter. It should be able to peer into space three times further than Aricebo. Artist’s depiction of the what the completed telescope will look like. 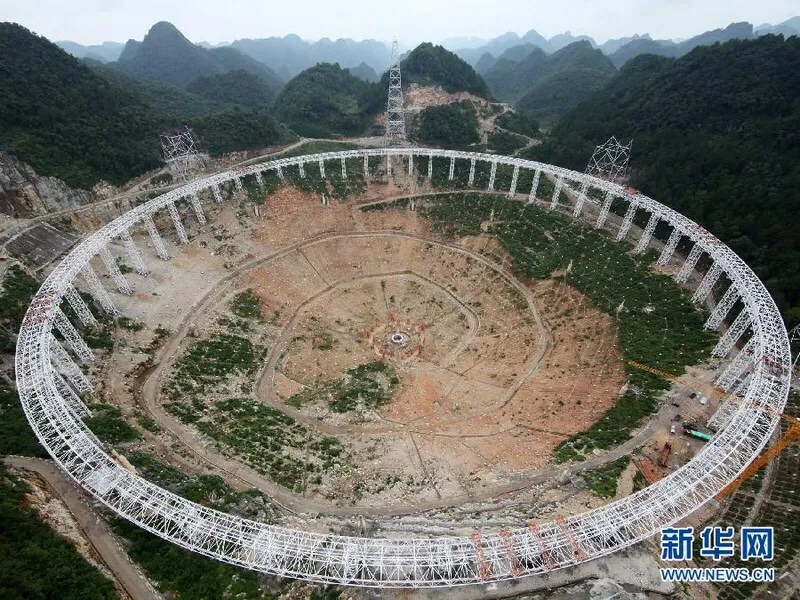 “A radio telescope is like a sensitive ear, listening to tell meaningful radio messages from white noise in the universe,” noted Nan Rendong in China.org.cn. He’s the chief scientist of the FAST project with the National Astronomical Observatory at the Chinese Academy of Sciences. Rendong likened it to identifying the sound of cicadas in a thunderstorm. 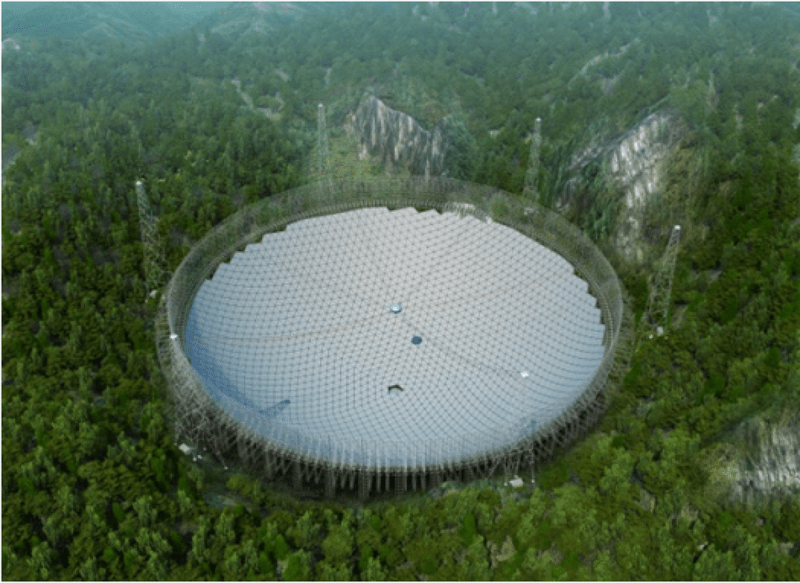 The big dish should be able to pick up exceedingly weak signals, allowing astronomers and SETI scientists to delve further and farther back in the Universe’s history. Contact the author at george@io9.com and @dvorsky. Top Photo: A shot of the construction site taken last year. All images by Xinhua.